This is one of my very favorite pens. It was found for me by another collector who knew I wanted one. 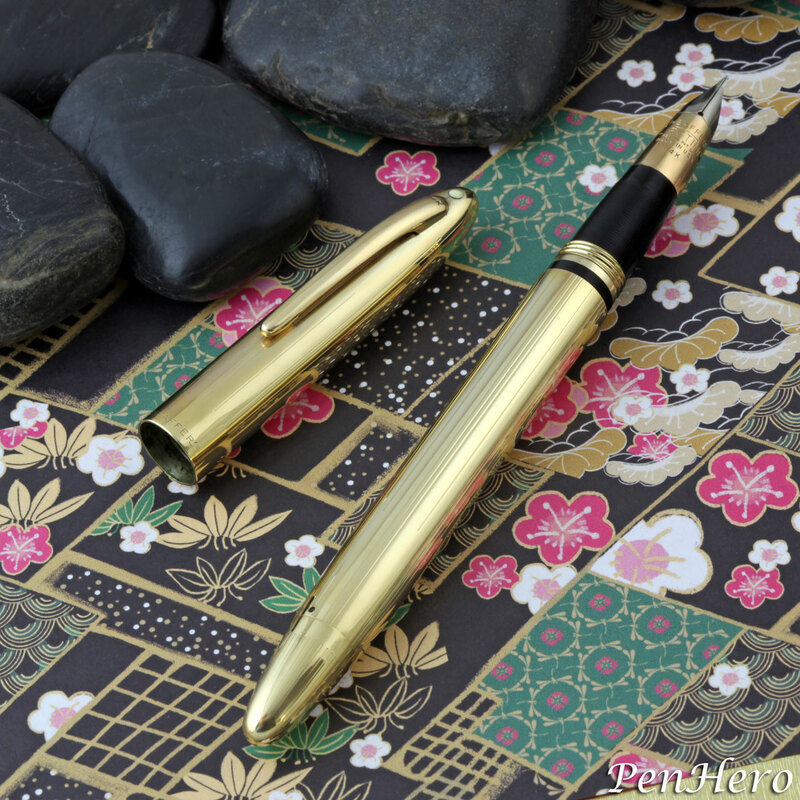 The Sheaffer Snorkel Masterpiece (c1952-1959) is a stunning pen. This is a difficult pen to find and more so in really top condition. 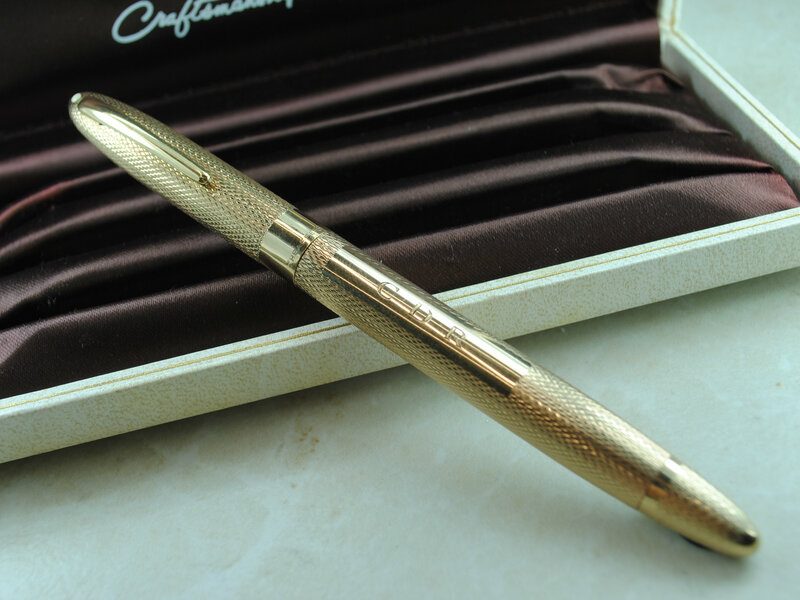 The Masterpiece was the top of the line for Sheaffer, with the cap, clip, barrel, and end cap all made of solid 14 karat gold. 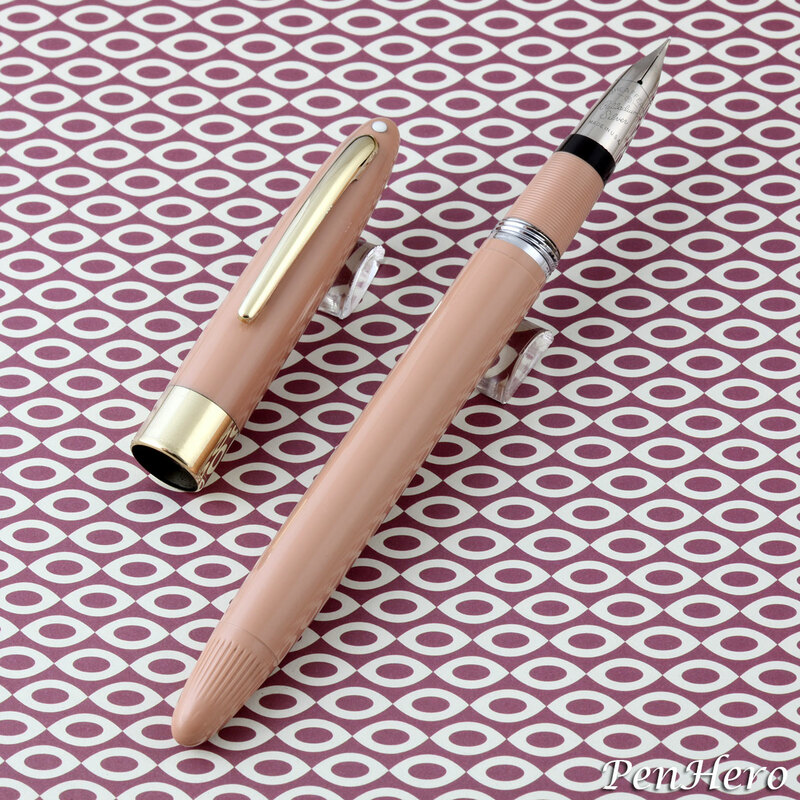 The Triumph 14 karat two-tone gold nib with platinum mask was unique to this model, with "Lifetime" stamped on the nib. 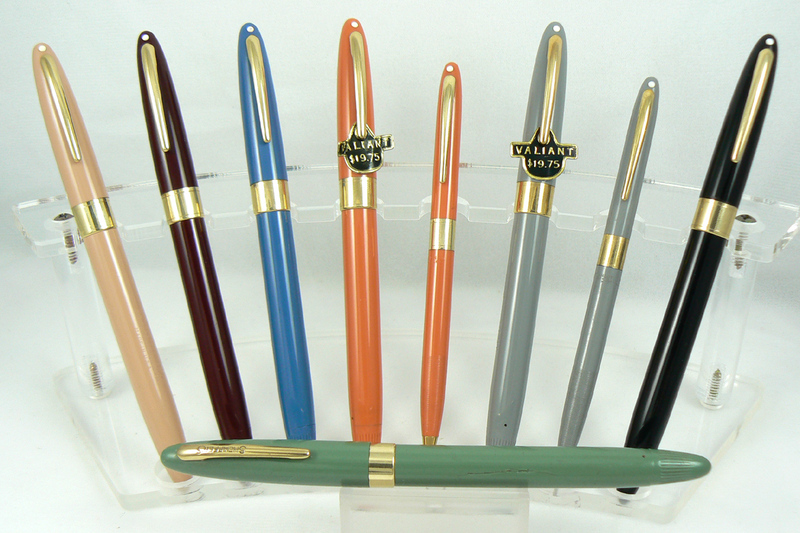 Sheaffer also made 18 karat and 9 karat gold models in a fine barley in the UK. This is the USA version. 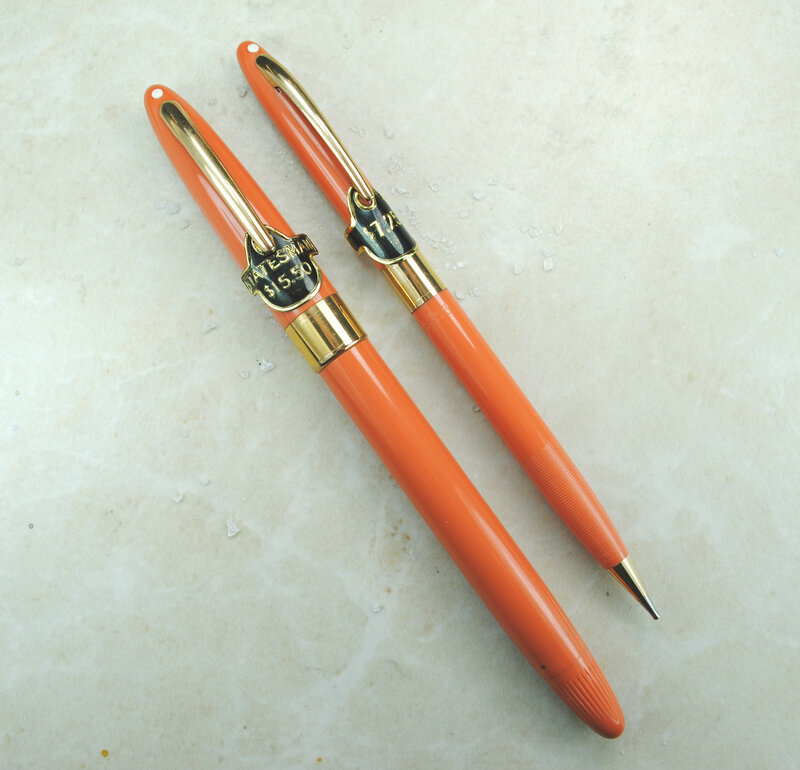 These were pricey pens, retailing for $110.00 in 1958. They go for much more today. Expect to see them offered for more than $1,000 in excellent condition. Wow! What a pen. A little too rich for me, figuratively and literally, but I can look all I want for free. the economical penster - celebrating inexpensive pens! Good gosh that's stunning! I really want to add one to my collection, particularly a burgundy one but I would be more than happy with black. with a charge from over several millennia of continuing the art of recording man's life. I would be happy even with red. SJ Rose 9ct Snorkel Masterpiece commissioned by Sheaffer UK. 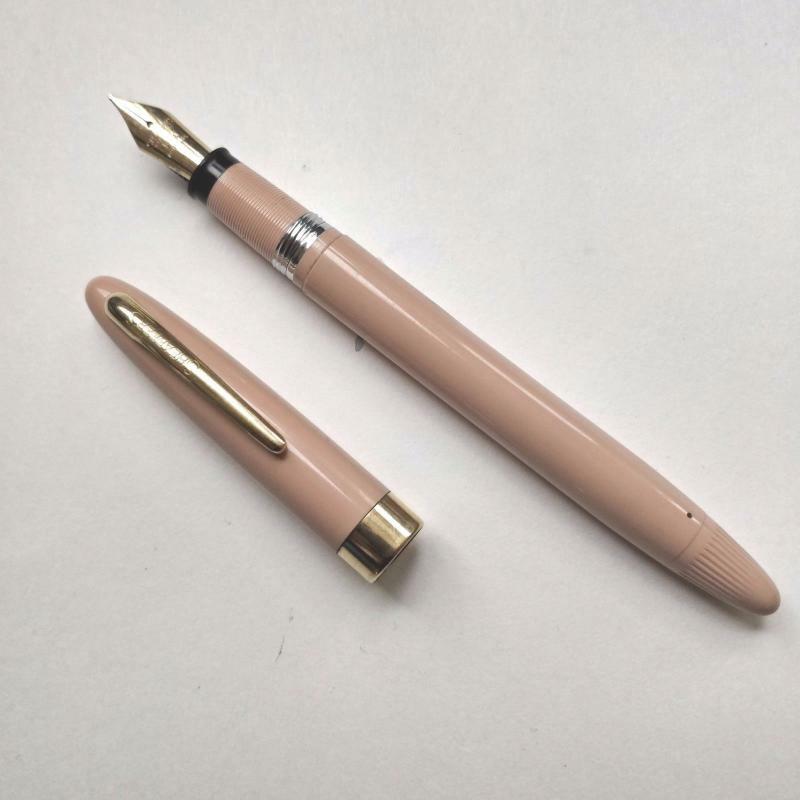 This is a Sheaffer Snorkel Statesman in Buckskin Tan c. 1957-1959. 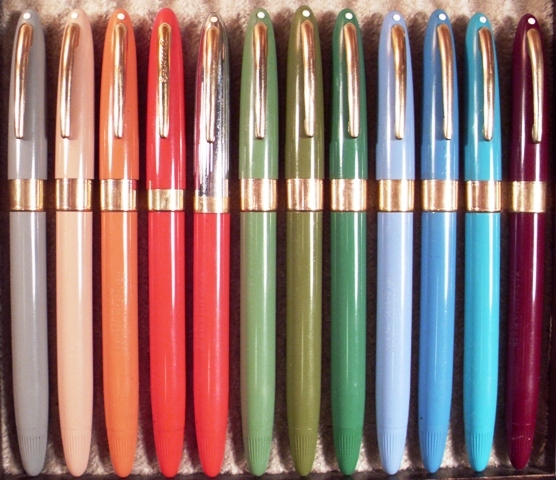 Buckskin Tan was one of the new Snorkel colors introduced in 1957 and pens of this color can have matching color sections, as shown. 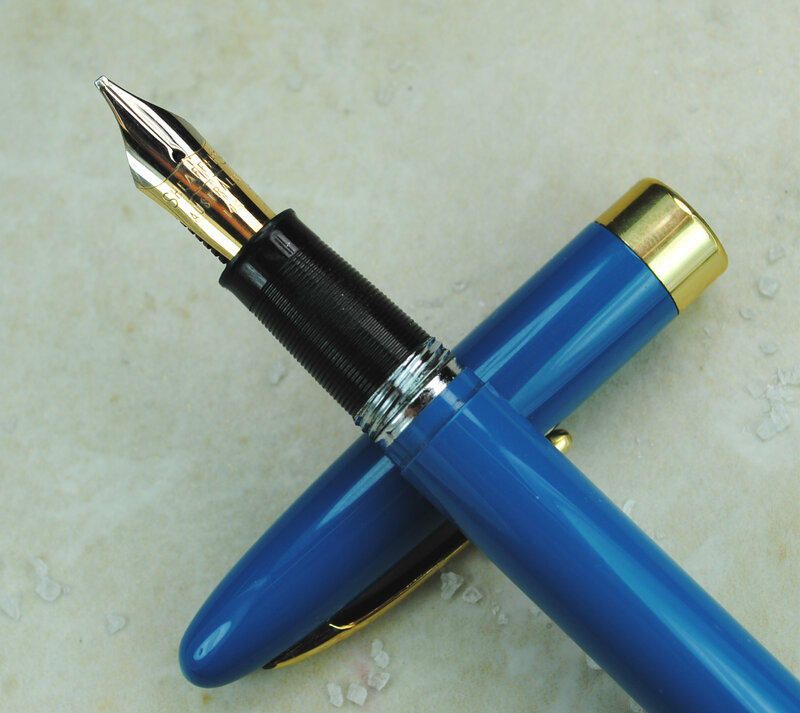 The Statesman has a Triumph palladium-silver alloy nib (may be hallmarked PdAg), plastic cap and barrel, gold-filled clip and 3/8" wide gold-filled cap band. Colors produced were black, burgundy, pastel gray, pastel blue (or aqua), pastel green, peacock blue, buckskin tan, mandarin orange, fiesta red, and sage green. In 1956, the Snorkel Statesman sold for US $15.50 and with a matching pencil, US $22.75. Edited by PenHero, 20 November 2017 - 14:17. I've got one as well, but none of the other rare colors unfortunately. Did you polish the barrel to get that glossy shine? Very nice! Ron Zorn has a polish he recommends. He did a lot of my Snorkels, including the one above in my photo. Thanks! 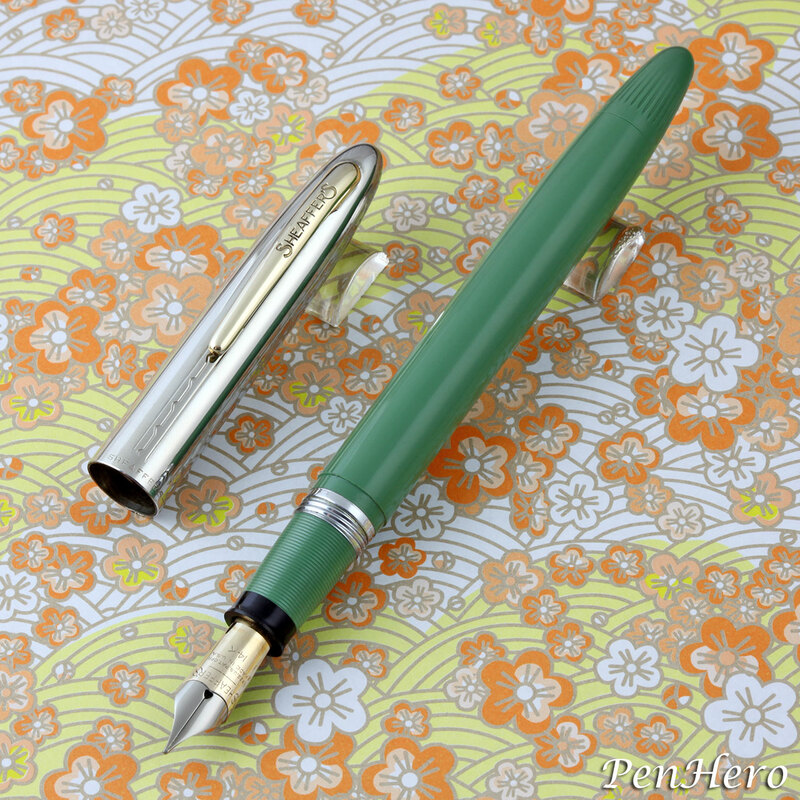 This is a Sheaffer Snorkel Sovereign in Sage Green c. 1957-1959. 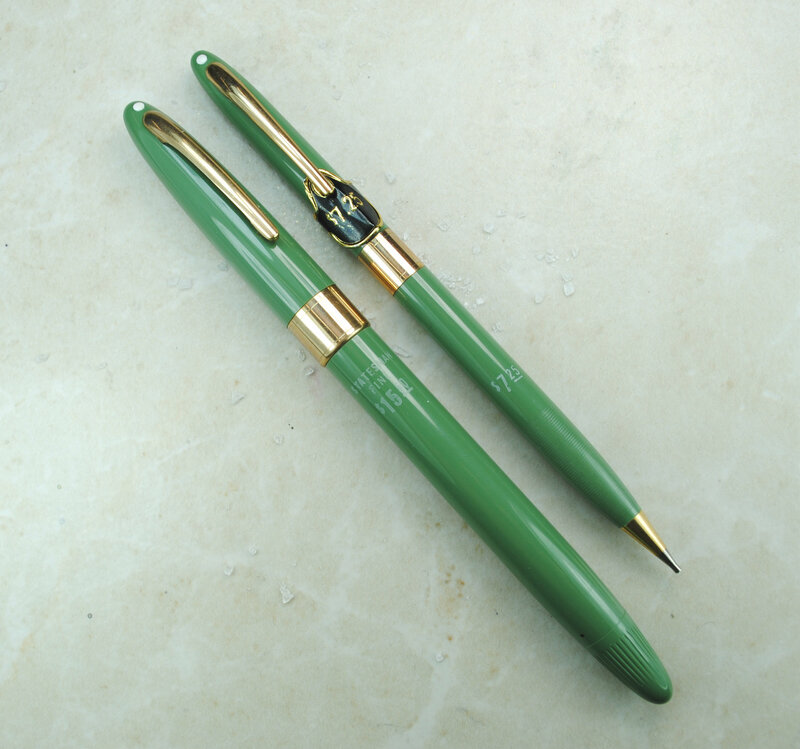 Sage Green was one of the new Snorkel colors introduced in 1957 and pens of this color can have matching color sections, as shown. 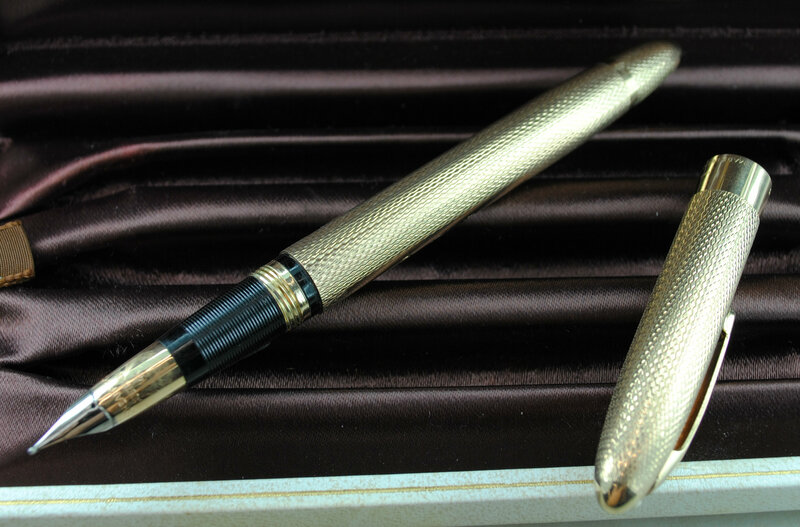 The Sovereign has an open 14 karat gold nib with platinum mask (similar to earlier Feathertouch nibs), polished stainless steel cap with five engraved or stamped panels, and a gold-filled clip with "SHEAFFER'S" stamped. The cap panels are a set of two straight lines with a dashed and wave or ripple line between. Barrel colors produced were black, burgundy, pastel gray, pastel blue (or aqua), pastel green, buckskin tan, vermilion (a tangerine), and sage green. In 1956, the Snorkel Sovereign sold for $12.50 and with a matching pencil, $17.75. I'll see your Sovereign, Jim, and raise you a white dot. A Sage Green Statesman set, one of the chalked sets I've been fortunate enough to find. Very nice! I have three Sage Green pens. The one in my photo also has chalk marks. Hard to find them like that! If you're looking to complete your collection, I've got a black I'll part with for the right price. A few that used to live with me. Don't feel bad. I'm old; I'm meh about most things. 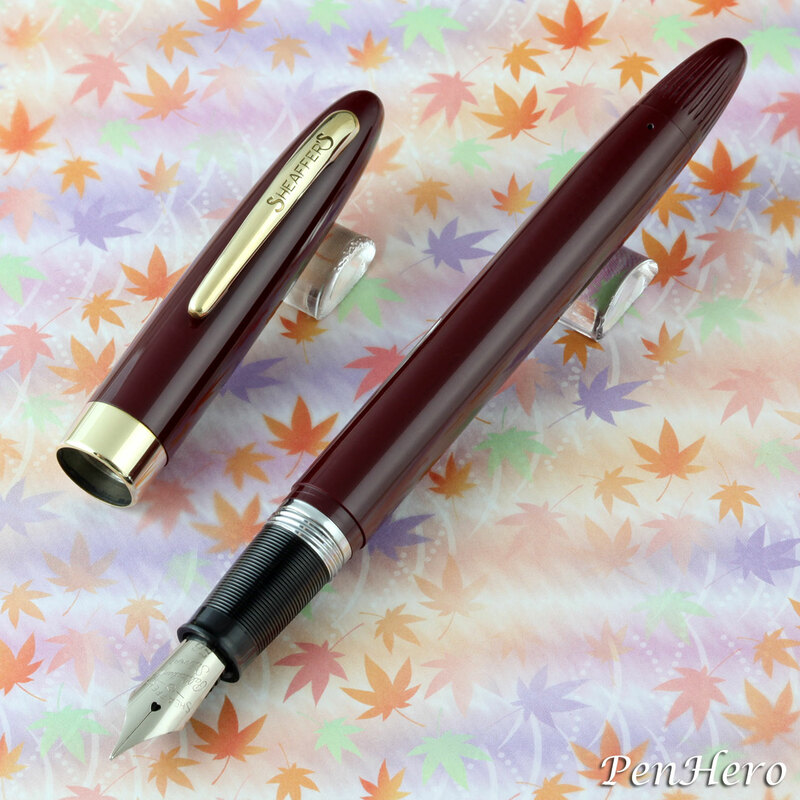 This is a Sheaffer Snorkel Special in Burgundy c. 1956-1959. The Special was a new entry-level model below the Admiral. 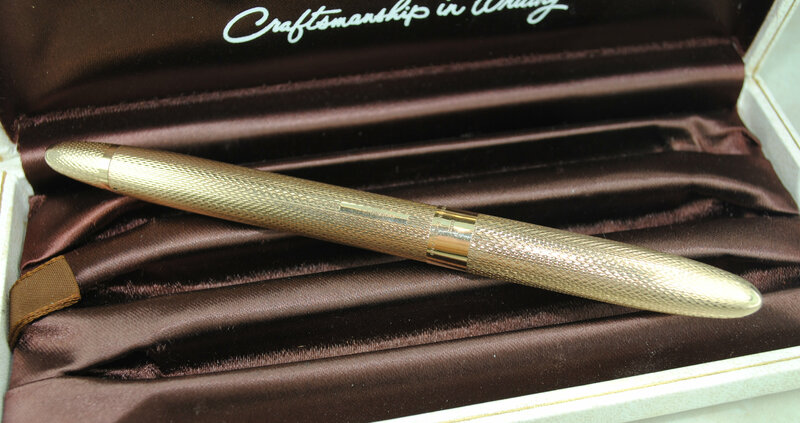 It featured an open palladium silver nib, plastic cap and barrel, gold-filled clip stamped "SHEAFFER'S", and 1/4" wide gold-filled cap band. It was introduced prior to the new colors launched in 1957 as the colors were black, burgundy, pastel gray, pastel blue (or aqua), and pastel green. 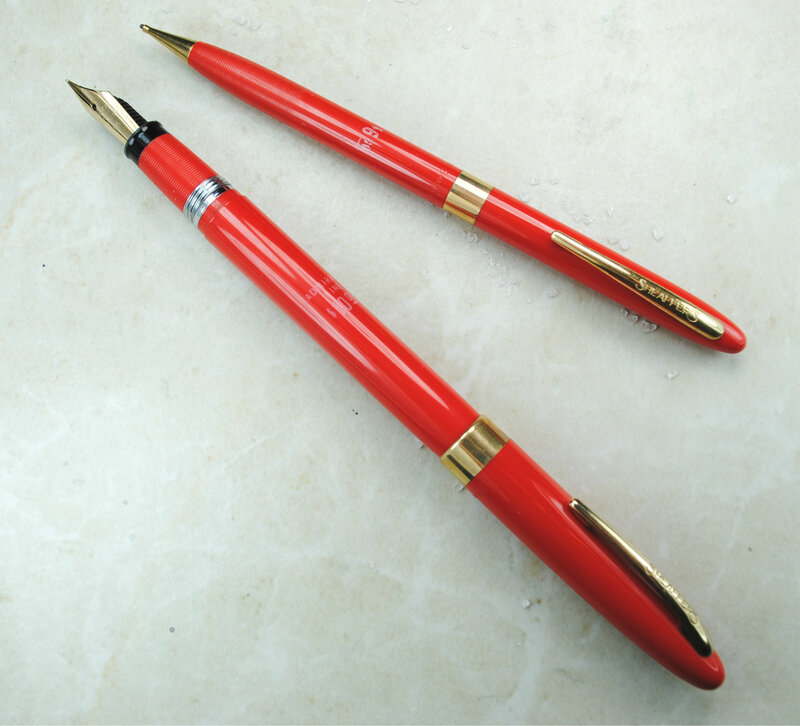 The Snorkel Special pen sold for US $7.95 in 1956 and the pen and pencil set sold for $13.95. Edited by PenHero, 20 November 2017 - 17:10. Corrected the list of colors. Interesting! I didn't know the Special was a later model. I had a pastel green or sage green Special a couple years ago in mint condition and sold it, which I now regret. I've always liked the Script nibs, whether Triumph or traditional. Hey, Greg, maybe your mandarins ran away to live with me? Nope, yours was a Valiant and mine is a Statesman.